I've said it over and over again, but the way I start my mornings is so important. I just want to take a minute to really thank you all for all the sweet messages and comments that I have gotten over the past few months. Many of you know that I just haven't felt like myself and my anxiety has been pretty bad, but you have been the sweetest and I want you to also know that I am always open to talk and hear you out about anything. We're a community! Okay, let's talk about the importance of starting your morning off right; focused on gratitude and goals! I'm probably a little crazy about how I start my day, but its because I really believe that the way your day begins set the tone for the rest of the day. We've talked a lot about morning routines here, but I'm getting even more specific today. I'm sharing how I focus on gratitude and goals at the start of my day. According to Happify, people who practice gratitude regularly by taking time to notice and reflect upon the things they're thankful for experience more positive emotions, feel more alive, sleep better, express more compassion and kindness, and even have stronger immune systems. Who doesn't want to be happier, sleep better, and have a stronger immune system? I want ALL those things! 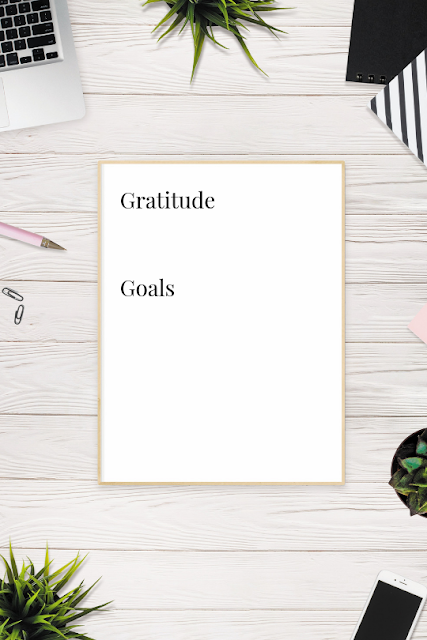 Every morning, I write down five things I am grateful for. Sometimes, it is really specific that happened the day before and sometimes, it is something like "I'm thankful for my bed." 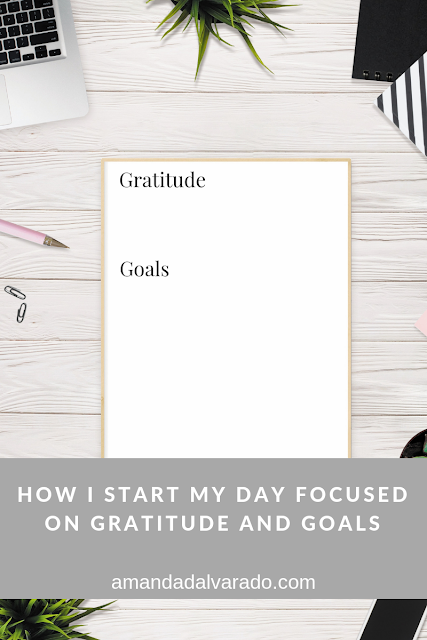 By focusing on gratitude at the start of my day, it helps keep me in a positive mindset for the rest of the day. Once I do that, I pull out my journal and write down 10 goals. These goals pretty much are the same every single, but I write them as if they have already happened. For example, instead of writing "I will live in New York City" or "I want to live in New York City," I would write, "I live in New York City." By essentially telling yourself that this has already happened, it puts you into action to make it happen. This is something relatively new that I've added to my morning routine and my mindset going into the day has benefitted from this! Writing down your top 10 goals also just remind you every single day what you're working for. You can keep a running list on your iPhone or laptop, but I totally recommend getting a notebook so you can physically write it down. My favorite place to pick up a notebook is TJ Maxx because they're cute and inexpensive. I'm not spending a lot of money on a notebook. What are other ways that you keep your mind positive and focused on gratitude?